What this table shows, interestingly enough, is that the proportion of white Americans declines as you look higher up the degree structure. That goes against a typical demographic principle of social hierarchy, according to which a more culturally dominant group is better represented at higher levels of the social scale. (We saw an excellent example of this in looking at gender in anthropology, earlier this fall — even though men are a minority of anthropologists, they are increasingly well represented at higher educational levels.) However, it seems in the data that the lower representation of whites at higher levels, like the doctoral level, should not necessarily be understood as a promising sign of racial equality. Rather, the dip in relative white dominance seems related to the huge number of foreign students who appear at the MA and above all at the PhD level, where they constitute the largest demographic bloc (16.57%) after American whites. Very few foreign students come here for anthropology BAs (1.36%), but they do seem to come here for, in essence, upper level professional training. Distressingly, we can also see in this data that blacks and Hispanics (the two largest American minority groups) are radically underrepresented at all degree levels in proportion to their share of the population. 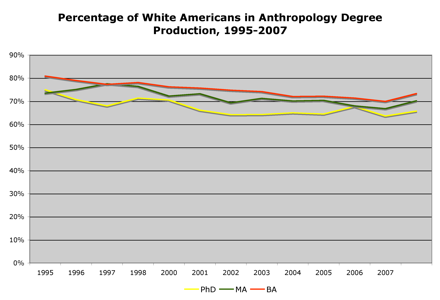 And their presence in anthropology is not constant across degree levels: there is a noticeable drop between the fraction of blacks and Hispanics who get BAs and the fraction who get graduate degrees. Worth noting, on the other hand, that Asian-Americans and American Indians are quite well represented in proportion to their fairly small fraction of the American population. I tend to suspect that class is a hidden variable in the relative success of Asian-Americans, since they are (at least ostensibly) better off in the American class system, but the NSF’s national statistics are beautifully and outrageously silent on the question of students’ class origins. So that has to remain pure hypothesis for the time being. 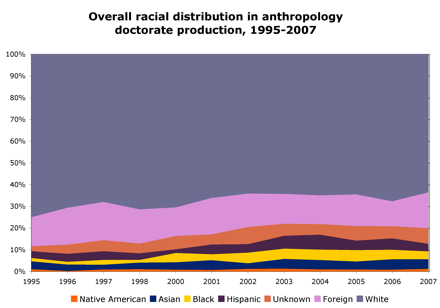 Now, it seems to me that a very interesting demographic phenomenon here, and a striking departure from the parallel lines on the graph of whites above, is the fact that black Americans are in fact growing quite substantially as a fraction of the anthropology bachelors’ population — the population has almost doubled since 1995 – and yet things seem to be changing very slowly at the doctoral level. Of course, there can be a time lag between these two lines — if more of group X suddenly get more BAs, it would still take that same group of new BAs most of a decade to get PhDs, if any of them want to — and yet I’m still struck by the extremely low numbers at the graduate level. 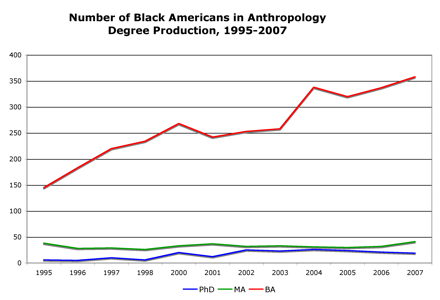 Still talking about black anthropologists, then, one does notice a climb at the PhD level from 5-6 (total for the year) in 1995-6 to a couple of dozen on average this decade, but at the master’s level, things are about constant. As we know, affirmative action is not doing so well these days; and although we can guess that diversity fellowships play a role in the small increases we do see, it’s hard not to think that it’s radically insufficient. In lieu of a conclusion, let me just note that it would be good to look at racial statistics among American anthropologists at large, on the AAA membership, on graduate students (are there major race-related selection effects that function within graduate education? it seems quite possible)… I can’t do that now, but I would love to have thoughts on what else might be worth examining. Other disciplines? Other countries? But for the time being, I confess I find this set of data somewhat disheartening. There’s progress towards racial equity, but it’s slow, and not enough. Thanks, Mike. Frankly, I’m still somewhat stunned by these numbers. I knew that phds are fairly unusual in the world, but I wouldn’t have guessed that any major ethnic group would be in the double digits, yearly, across the nation. Yeah, it would be interesting to know whether there’s a zero-sum situation across social science disciplines; my instinct is not necessarily, but I guess you’d have to check. A good follow-up post might examine a particular racial group across different social science disciplines… not that I have time to write that just now. But yes, I definitely support increased collection of data about class backgrounds 😉 I don’t know if I am inherently in favor of nation-wide reporting, though; can’t you find this stuff out through good surveys also? What are the costs/benefits of mandatory reporting vs survey research? ok, I checked the box to be notified of follow up comments via email. My guess is that if you send voluntary surveys to departments, many departments will neglect or downright refuse to fill them out. They never asked me my class background, so they would be unable to answer that question. If the surveys go to individual students the non-response problem will be even worse. I don’t think 100% of an attempt to increase diversity in anthropology comes at the expense of other social sciences, but some portion probably does. Another large chunk comes at the expense of diversity in business, politics, etc. I don’t know anything about sample research; is a 45% response rate considered decent? Yes, some survey research is certainly possible using only volunteers. 45% is a fairly high response rate, given the nature of the study, but still low in an absolute sense. I haven’t given much thought to this but we might think about how the writers of the survey are highly constrained in what they might ask, time consuming or controversial questions might kill their response rate. Thanks for sharing this with us! I agree with Michael, I would be interested to see how your figures compare across disciplines as well in relation to PhDs afforded to different groups in general. But actually what I was even more curious about is whether you had an idea on how to bring in “class”? I’d suspect that if you were to ask, most people would respond they were middle class (if you could get them to respond of course), since to my understanding the majority of Americans consider themselves to be middle class. One of my professors once joked about how at an University Chicago alumni event he’d asked the alumni what class they considered themselves to be. Almost all of them self-identified as middle class, even though many of them made well over $100,000/year, and had substantial assets. So, how would you unpack the category of the middle class then? Would you ask people about their parents’ income level? Or education level? Or what stores they shop at for clothes, food? Here in Brazil with race- and “class”-base affirmative action finally setting in at most universities, the “quotas” are filled by students who have gone through public middle and high schools, and whose family income is below a certain level, and who self-identify as black (unlike the US, this is often a much less self-evident category than class in Brazil).